Click on the pictures for the larger view. Quotes are taken from the Official Souvenir Guide for the Abbey. 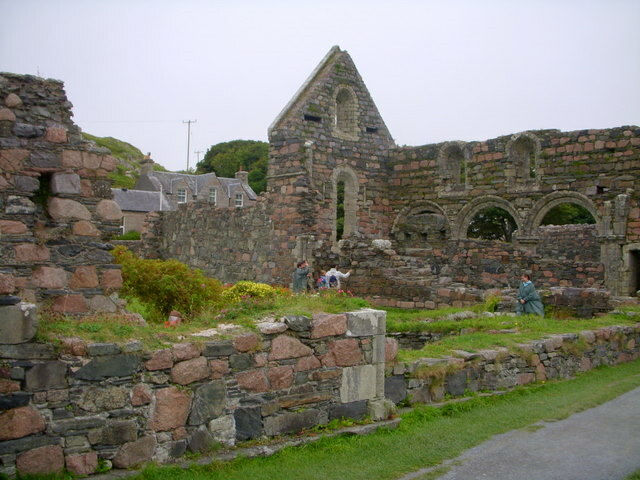 Iona, of all the sacred places in Scotland, is an enduring symbol of Christianity. 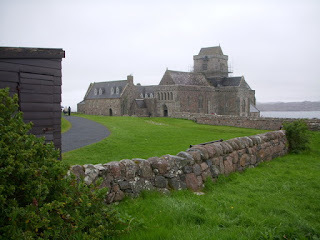 St Columba arrived on the island with twelve companions in AD 563 and founded a monastery that was to become the heart of the Scottish Church during its early years. One of the most important monasteries in early medieval Europe, it was a renowned center of learning and artistic excellence with extensive international contacts. On the day before, the three of us, Cathy, MadChauffer, and I, attempted to take the ferry to Iona from the Isle of Mull, but, to our surprise and disappointment, the ferry was not running that day. The weather was lovely, and we went instead by boat to visit the Isle of Staffa and the Tresnish Isles. On the next day, the weather turned rainy and stayed wet nearly all day. But if we wanted to visit Iona, we had to go in spite of the dreary weather, because we were leaving the Isle of Mull the following day. After we arrived on the island by ferry, we had lunch, and, from then on, we went our separate ways. The great building enterprises of around 1200 included the nunnery. Earl Reginald, its founder installed his own sister, Bethoe (Beatrice), as the first prioress. Although ruined, the nunnery is one of the best preserved in Britain. Such houses were common in Ireland, and it is likely that many of Iona's first nuns were Irish. The ruins of the nunnery are breathtakingly lovely. Cathy and I hung about the ruins for quite some time, Cathy longer than I, because she was photographing the birdies (and beasties?). I moved on toward the Abbey. 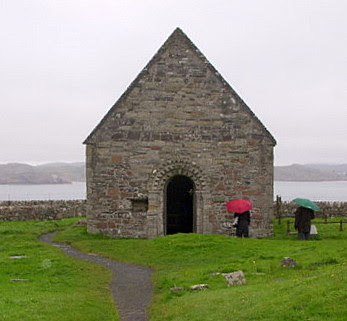 St Oran's Chapel, restored in 1957, was probably built as a family burial chapel either by Somerled, 'king' of the Isles, who died in 1164, or by his son Reginald. Irish influence can be seen in both the architecture and the decorative doorway of this fine building. Inside is an elegant tomb-recess, built in the late fiftenth century, perhaps by John, the last Lord of the Isles. Small, ancient churches like St Oran's are amongst my very favorite of old structures. I waited behind a man and a woman to light candles for our group of three travelers. Once their candles were lit, instead of moving away, they began a kiss that went on, and on, and on, and on, all the while blocking the way and preventing me from lighting my candles. Only the couple and I were in the chapel, and I waited, and waited, and waited for the pair to stop kissing and move aside. When I became tired of standing, I sat on one of the seats in the chapel to wait for them to be done. They must have kissed for five minutes or longer. I've never seen anything like it, but perhaps I've led a sheltered life. 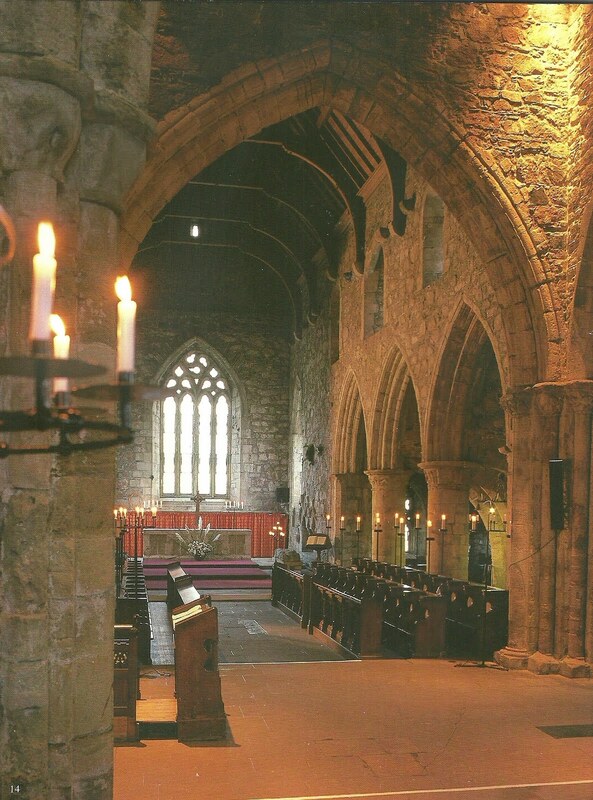 When the kissing pair finally moved away and left the chapel, I lit my three candles and sat down again to have the chapel to myself for a while in peace and quiet. On the way to the Abbey church, the rain fell heavily, but nothing to do but to continue on, because I would not have another day. The shelter of the church was quite welcome. Always the most public part of the church, the nave is a simple rectangular space without aisles. Two processional doorways lead north out to the cloister. The choir is beautiful, indeed. The carvings on the capitals of the columns are wonderfully done, with each capital having a unique design. Unfortunately, the detail cannot be seen in the photo, nor could I find a good link online to close-up pictures of the capitals. I did not want the man in the kilt in the picture, but he wouldn't move away from the font. How about that calf? I cropped the rest of him. I expect he may not want to be in a picture on my blog any more than I want him here. 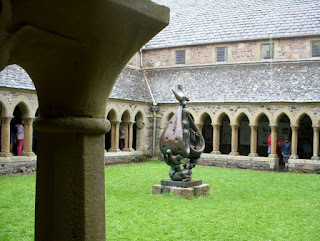 With the rain still falling, I was a bit reluctant to leave the church, but there was more to see, the Cloister, the Bishop's House, the Abbot's House, and the Abbey Museum. The lean-to of the cloister is supported on an arcade formed of paurs of otagonal columns with moulded bases and capitals decorated mainly with scalloped and water-leaf ornament. Numerous original fragments are preserved, but only a few were in good enough condition to reuse during the restoration of 1958-59. Many of the new column capitals are carved with bird and foliage designs. Indeed, the old carvings on columns, crosses, archways, tombstones, and elsewhere throughout the Iona complex of structures are amazing. As I entered the Cloister area, a large group of German tourists, which included a shouting tour guide, was assembled, but fortunately, the leader was winding down his noisy spiel, and the group soon left, only for me to run smack up against the kissing couple, once again engaged in what seemed to be their favorite pleasure of the day. Since I was not confined to a small, enclosed space with them, I moved on and didn't clock the length of the kiss. 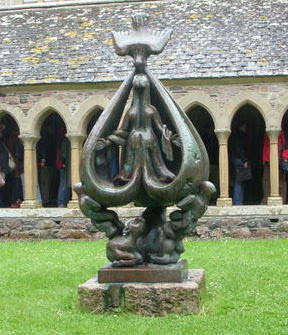 In the center court of the Cloister stands the wonderful bronze sculpture of Mary and the Trinity by sculptor Jacques Lipchitz. The cross stands in the Abbey Museum. 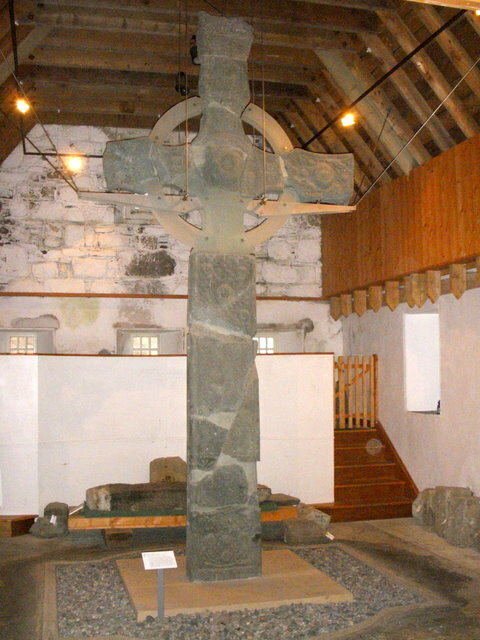 A particular highlight of the museum is the reconstructed St John's Cross that formerly stood close to St Columba's Shrine, together with the surviving fragments from Iona's two other ancient high crosses, St Matthew's Cross and St Oran's Cross. On the way back to the ferry landing from the Abbey church area, my feet gave out, and I stopped for tea, for shelter from the rain, and to rest my feet. The tea and biscuits were some of the most enjoyable of my life. After tea, I continued back toward the ferry landing, arriving more than an hour before our assigned departure time on the next-to-last ferry. There were Cathy, who had arrived about 10 minutes before me, and MadChauffeur waiting. Cathy and I had visited all the same places, but we never once ran into each other. MadChauffeur said he had been standing in the rain "for hours", which made me wonder why he hadn't gone into the pub and had a beer instead. He said he thought I was lost, that I had gone the wrong way. I don't see how I could have gone the wrong way, because the tower of the Abbey church was visible from the nunnery, where we started out. Also, we all three had cell phones. I offered my number to MadChauffeur before we separated, but he was not interested, and he didn't offer to give me his number. Cathy and I had exchanged numbers early in the trip, so we could have been in touch at any time. The hours-long wait in the rain was not at all necessary. When we went to board the ferry, which was about to leave, Cathy went first, and MadChauffeur and I tried to board together, but I could not find my return ticket. We stood there in the rain while I searched all my many pockets and my purse without success, and MadChauffeur went on and boarded the ferry. I thought it would be "Bye-bye, friends", but the ticket-collector allowed me to board without a ticket. Of course, once I was on the ferry, I found my ticket. My readers, I have only scratched the surface in picturing and describing our visit to Iona, which is an extraordinary and holy place, where the prayers of many over centuries echo and linger. I may do another post on Iona, at least a photo essay, for I have lots more pictures. I've been working on this post for days, off and on, and I wouldn't want to know how much time went into putting the pieces together. 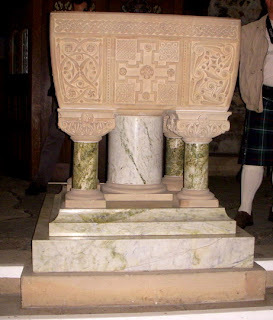 But for St John's Cross, I didn't touch on the treasures in the Abbey Museum, the old crosses, the carved gravestones, and much more, including places visited but not described in my post. Thanks for the memories -- here are my photos from the trip our daughter and I took - MC and Mrs.MC took us there - we stayed for 3 nights and 4 days. A lovely place tho we had better weather than yours. What I love is the Sheila na gig in the wall of the nunnery. Ann, thanks. I saw where you and your daughter stayed. Iona is a lovely place to visit. Lovely pictures - reminds me of our trip there (including the rain). "We were now treading that illustrious Island, which was once the luminary of the Caledonian regions, whence savage clans and roving barbarians derived the benefits of knowledge, and the blessings of religion. To abstract the mind from all local emotion would be impossible, if it were endeavoured, and would be foolish, if it were possible. Whatever withdraws us from the power of our senses; whatever makes the past, the distant, or the future predominate over the present, advances us in the dignity of thinking beings. Far from me and from my friends, be such frigid philosophy as may conduct us indifferent and unmoved over any ground which has been dignified by wisdom, bravery, or virtue. That man is little to be envied, whose patriotism would not gain force upon the plain of Marathon, or whose piety would not grow warmer among the ruins of Iona!" "The episcopal church consists of two parts, separated by the belfry....That these edifices are of different ages seems evident. The arch of the first church is Roman, being part of a circle; that of the additional building is pointed, and therefore Gothick, or Saracenical; the tower is firm, and wants only to be floored and covered." 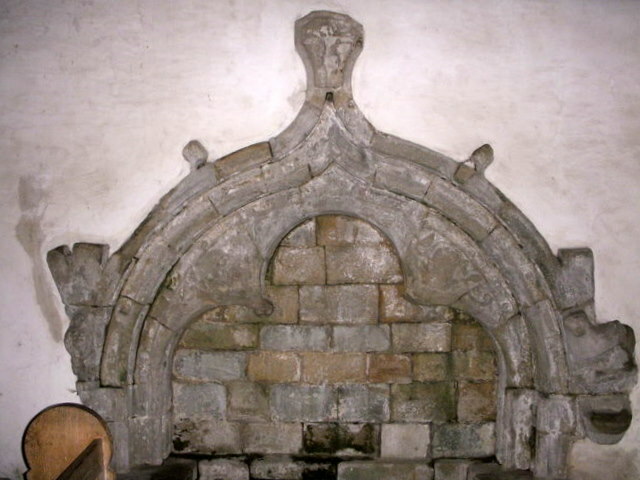 "The bottom of the church is so incumbered with mud and rubbish, that we could make no discoveries of curious inscriptions, and what there are have been already published....The chapel of the nunnery is now used by the inhabitants as a kind of general cow-house, and the bottom is consequently too miry for examination. Some of the stones which covered the later abbesses have inscriptions, which might yet be read, if the chapel were cleansed. The roof of this, as of all the other buildings, is totally destroyed, not only because timber quickly decays when it is neglected, but because in an island utterly destitute of wood, it was wanted for use, and was consequently the first plunder of needy rapacity. "The cemetery of the nunnery was, till very lately, regarded with such reverence, that only women were buried in it. These reliques of veneration always produce some mournful pleasure. I could have forgiven a great injury more easily than the violation of this imaginary sanctity....Besides the two principal churches, there are, I think, five chapels yet standing, and three more remembered. There are also crosses, of which two bear the names of St. John and St. Matthew. 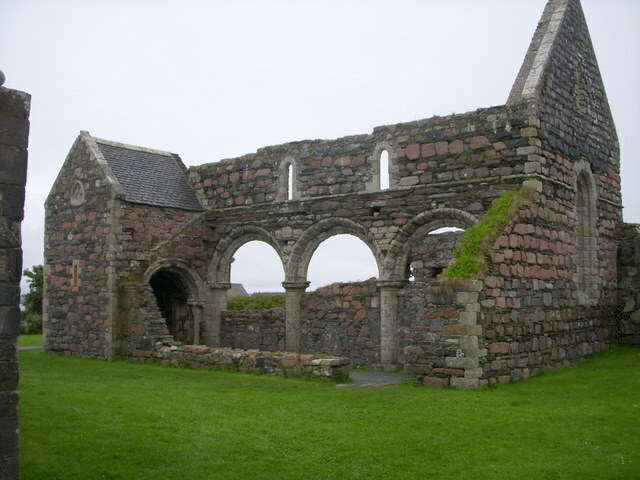 "But the fruitfulness of Iona is now its whole prosperity. The inhabitants are remarkably gross, and remarkably neglected: I know not if they are visited by any Minister. The Island, which was once the metropolis of learning and piety, has now no school for education, nor temple for worship, only two inhabitants that can speak English, and not one that can write or read." "We now left those illustrious ruins, by which Mr. Boswell was much affected, nor would I willingly be thought to have looked upon them without some emotion. Perhaps, in the revolutions of the world, Iona may be sometime again the instructress of the Western Regions." Mimi was followed around by a kissing couple and a man in a kilt, while I was followed around by the party of German tourists. I tried to sit and have some peace and quiet in St Oran's chapel and at once the tourists came in and started taking photos with flashbulbs while their guide gave them a loud talk. I went to the Abbey instead but while I was standing looking at the courtyard they all marched in there!! It was hard to feel the atmosphere. But the nunnery was beautiful, and the rain on the Abbey roof sounded very evocative. PS I'm not saying there is anything wrong with a party of German tourists per se obviously. Just I wished this one hadn't followed me round to all the quietest bits of the Abbey. Gary, you had the rain, too? Still, Iona is a lovely place, even in dreary weather. Rick, thanks very much for Johnson's commentary, even if my prose pales in comparison to his. Much of the rebuilding was in the last century. Although Iona has made a comeback as a living community, not everyone approves, because few of the members of the Iona Community are Celts. However, Celt or not, they deserve credit for restoring life to Iona, which one must agree the Celts did not do. Ann, your pictures are gorgeous. JCF, whatever you say? The weather gods seemed to agree with you. Cathy, it's odd that we saw all the same people, but we never saw each other. At least my readers know I'm not lying. My best memories from Iona are of the beautiful and peaceful nunnery and St Oran's after the kissing couple left. So, that's Iona! I imagine a dove motif is very prevalent. It is a shame that people don't know how to behave in a sacred place - I mean, I wonder if they'd behave that way in a local synagogue, temple or mosque? To so many, it's now just a tourist attraction, but it's been a holy place for a very long time. Still, it's the tourists, even the touristy ones, who help keep it open and safe to visit as a sacred place so. Sorry, Mimi, but after a year of college German, when you mentioned the German tour guide's spiel, I pictured this group of stereotypical Germans playing hide-and-seek in the cloister (spiel(en) means "play" - if I recall, correctly). wv: explaviu - what you try to do when your spouse catches you coming home from the bar at 3 am. Do post more of the pictures one of these days: Not only for the remarkable history of the place, but for the pix themselves, especially the interiors, in which I don't know how you got the lighting so right. Probably just the lighting effect from the dismal weather. Tour guides and their clientele in quiet places remind me of another sacred place in another country: Ryoan-ji temple (that's redundant) in Kyoto. That's the one with the famous sand garden, as distinct from the thousand other temples with unfamous sand gardens, all (I believe) worth seeing. So we sat down on the platform to contemplate the sand and the five stones, joining a number of other people among whom there might have been a few who were not round-eyes like us. In moments a Japanese tour group arrived, the guide with bullhorn in hand, and his clients were regaled with -- whatever he said -- and of course so were we. Fortunately, they didn't have time to waste, and they were off pretty quickly to the next place on the checklist. To be replaced pretty quickly by the next group. And so on. A very Zen experience, you might call it. Back to Britain and yet another holiness tradition. In the British Museum there is a newish pair of galleries devoted to Egyptian funerary practices. The person after whom the exhibit is named has paid her dues doing research among the tombs, and also dealing with Egyptian tour guides. So I wasn't much surprised to see the discreet signs there, and nowhere else in the huge building, ordering that no tour guides were allowed to deliver speeches to their guidees in those particular galleries. Shows the good side of having money to pay the piper, when even the British Museum will play some of your tunes. Lovely pics & commentary. Thank you. Such a bore when the "help" gets uppity! Mark, the German tourist group was similar to many other tourist groups and tour guides that I've seen from various countries. They tend to be intrusive if only by their numbers and the need of the guide to be heard by all the members of the group. As to the looong kiss, I'm of the old school. Any expression of physical affection which lasts over five minutes should take place in private. 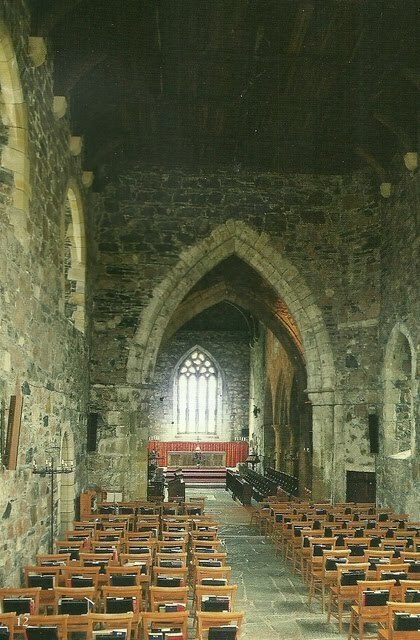 Porlock, the two pictures of the interior of the Abbey church are scans from the guide book. The rest are mine. Other than the baptismal font, my pictures inside the church did not come out good, no doubt due to the gloomy weather. I like the idea of having certain areas in historic places and museums declared free from tour guide speeches. Lapin, there's no help for uppity help. Fabulous buildings but that landscape is bleak! According to Samuel Johnson, the old trees went for firewood, which leaves for a bleak landscape. I don't have many outdoor pictures because I didn't want my camera to get wet. Holding an umbrella and trying to take a picture is tricky business. Most all the trees in Scotland were cut down by the English so they could run sheep. I shall not soon forget Mad Priest standing gloomily at the ferry stop with the rain dripping off the hood of his cape, like a character out of Lord of the Rings in the really grim bit of the book. Ann, and what a shame that is. A good portion England's forests went for shipbuilding when Britannia ruled the waves. Of course, I could be wrong! I think, probably, Ryoan-ji is important more because of it's connection with the Fujiwara. I've always wanted to travel to Japan and see Mt. Hiei and Enryaku-ji. I would like to see Honno-ji because of its association with Oda Nobunaga - like many beautiful, small, old temples, I understand it's mostly a slot in urban clutter, now. Still, I'd rather go as a visitor, not a tourist. It was just a funny image that came into my head! Tourists, in general, seem to be a pain. When we visit a local church or worship space of a different faith, we tend to be very quiet and respectful. Visit the Washington Cathedral on vacation, and even a devout Anglo-Catholic is taking flash photos and exclaiming loudly over the architecture! I've done it myself - an Orthodox cathedral in Boston. Some churches don't permit photos inside. I could not take pictures inside Durham Cathedral.